The answer is simple: have insects that have evolved a different respiratory system. At some point during Earth's history no animals had lungs, and then many clades developed different forms of those. Even among the hexapods, evolution is still ongoing: insects' tracheas are and advancement compared to the springtails' porous cuticle system. A lung is a tightly folded, highly vascularized trachea by another name. It's the way biology found to flip the bird at math and its square-cube law. 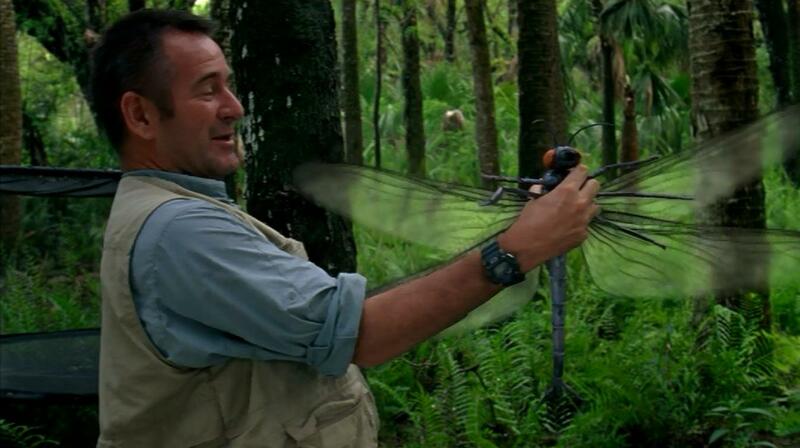 In a fictional world, it's no stretch to have insects develop something between what they have here and what we have. I don't think the main issue is oxygen (for either species). Food is the limiting factor. There are puppy sized spiders on earth now. If you go back to the pre-historic era, there are even larger insects. I'm assuming your main concern with oxygen is that most insects breathe through holes in their skin called tracheae. Tracheae evolve as the species evolve (just like humans evolved lungs). The limiting factor will be food and competition for it. Over-fishing and over-hunting are well-documented problems that most governments solve with quotas. The world isn't over-run with lions because large creatures that have to run fast to catch food expend MUCH more energy than slower, smaller creatures. Being a big, fast creature means you can starve faster. As far as giant dragonflies go, it's not so much the amount of oxygen in the air, as it is a higher atmospheric pressure which allows them to fly. You can compare this to light planes needing a much shorter takeoff roll at sea level than at my ~5000 ft home field. Or for a similar case, I was once given a battery powered toy helicopter (early version of a drone) that flew perfectly well in near sea level Silicon Valley, but wouldn't stay up at my home. WRT oxygen concentration, it's not so much the percentage of oxygen in the atmosphere as it is the partial pressure. So you can increase the O2 percentage at low pressures and be fine, as for instance when people in unpressurized airplanes use oxygen masks at high altitude. Likewise, when you increase the pressure, as with scuba diving, you have a higher partial pressure of O2 even though the percentage hasn't changed. People can survive extended periods of breathing air at several times atmospheric pressure. Any scuba diver who spends time at 32 ft/10 m depth experiences twice the sea level O2 concentrations. People have lived for weeks in undersea habitats at several times sea level pressure, e.g. https://en.wikipedia.org/wiki/SEALAB_(US_Navy) So humans shouldn't have any problems coexisting with giant dragonflies. Not the answer you're looking for? Browse other questions tagged environment atmosphere insects or ask your own question. How could bird people map the air? What effects would an atmosphere with the following composition and pressure have on humans? on the environment? what color would the sky be? What stars and composition of gases should my planets have to have a sky for each colour in the rainbow? How does the air remain stationary in The Big Blue?